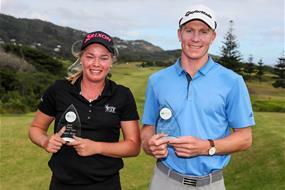 James Anstiss has played a round to remember at the Autex Muriwai Open to claim his second Jennian Homes Charles Tour title by two-shots over New Zealand’s number one amateur, Daniel Hillier. Brittney Dryland has followed in Anstiss’s footsteps by also completing a superb comeback in the women’s field as well as claiming her second title on the Jennian Homes Charles Tour. In challenging links golf conditions, Dryland’s experience helped her complete the fightback which all started with a clinical birdie on the second hole to close the gap over fellow Aucklander Caryn Khoo. Another wave of birdies at the start of the back nine meant that Dryland was able to take a few extra strokes on the final hole before engraving her name on another national title and finish two-shots clear of Danika Lee who shot the best round of the day in one-under par. “It’s an amazing feeling to win, I love playing out here and it’s one of the best courses in the country,” said an excited Dryland. The Jennian Homes Charles Tour will now take a break over winter and resume at the Harewood Open in October.